So while he was inside working on setting up the plumbing for the bathrooms and the kitchen, my father and I were outside. Monday my father was on the roof, while I was conquering (or failing, really) my fear of heights perched on a ladder > on two beams lain across the frame of the deck > a couple feet off the ground. You step in the wrong spot, you fall. I did fall. 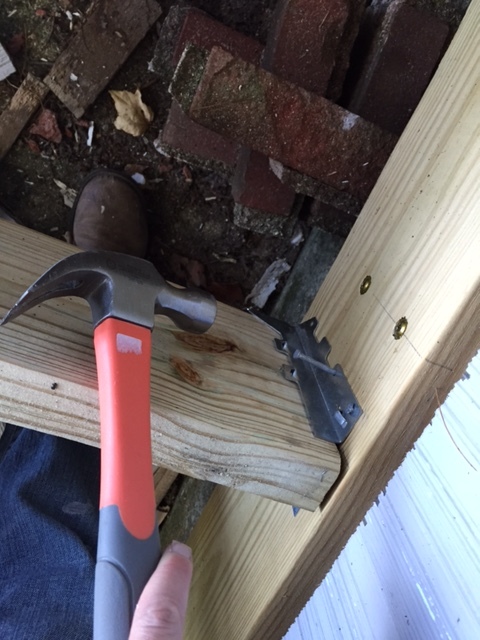 I also smashed my thumb with the hammer, got hit twice by boards with nails in them, punched myself in the face while holding a hammer, and felt generally grumpy. 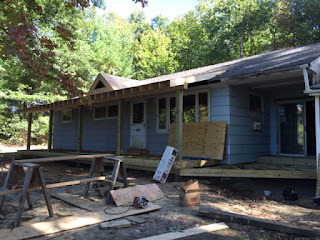 I didn't take any pictures on Monday because I was so focused on not falling whilst on the ladder as I pulled the brittle boards off the trim of the roof. 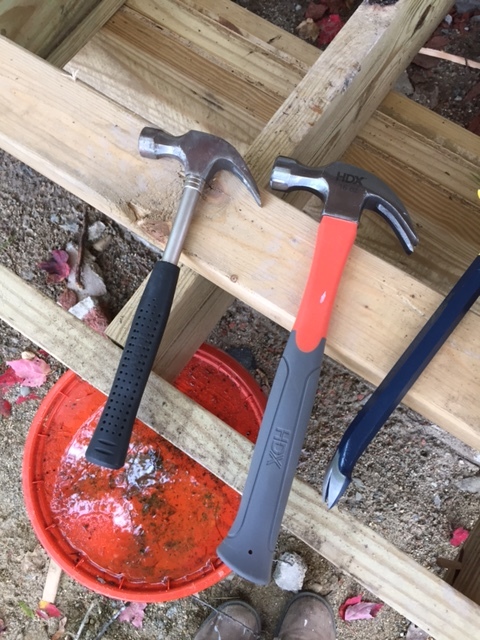 Then we went to Home Depot and Lowe's for various items, one of which was a new hammer for me because according to my father my hammer "giggles when it looks at nails". In my defense, my tools have done the job just fine for projects around my apartment for the past nine years, thank you very much. 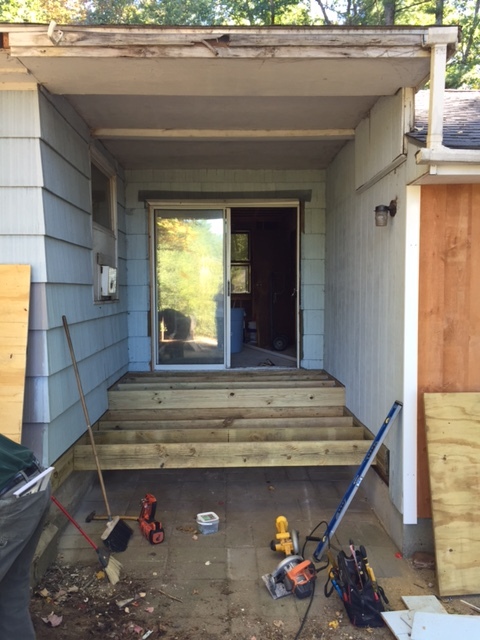 We also looked at doors (we will be needing two), tile for the bathrooms, discussed the master shower, looked at potential tile for the kitchen, decided on showerheads and picked up plywood. Then after going home and showering I donned my new Norwich sweatshirt (thanks Dad!) and had a proper cuddle with Beans. 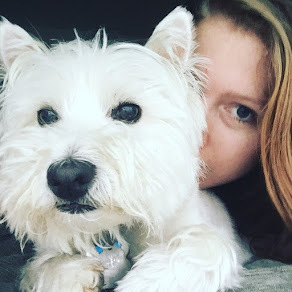 *Note: the cuteness may overwhelm you. Take deep breaths and proceed with caution. Wednesday was a beautiful day. It was sunny, clear and chilly to start, but I wore layers and was just happy to be outside and not stuck in the office in front of a computer. What was my task for the day? I was secretly praying that my father wouldn't make me stand precariously on a ladder AGAIN. Being a beautiful day we both worked on the deck. 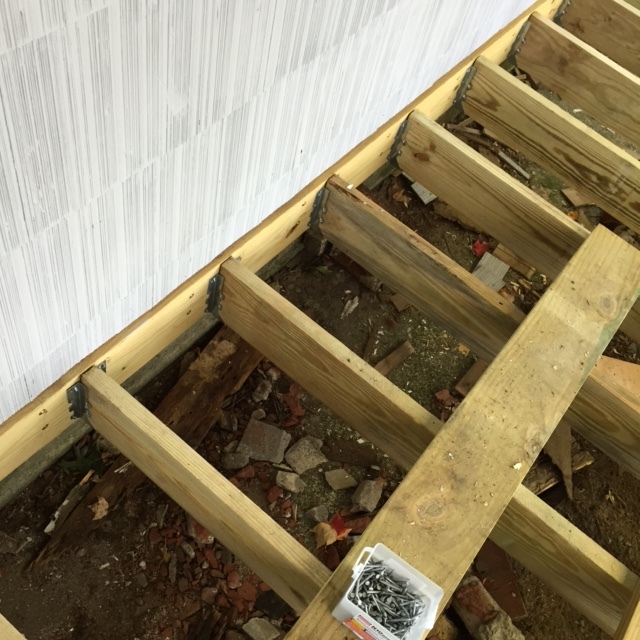 I was tasked with installing all the joist hangers. 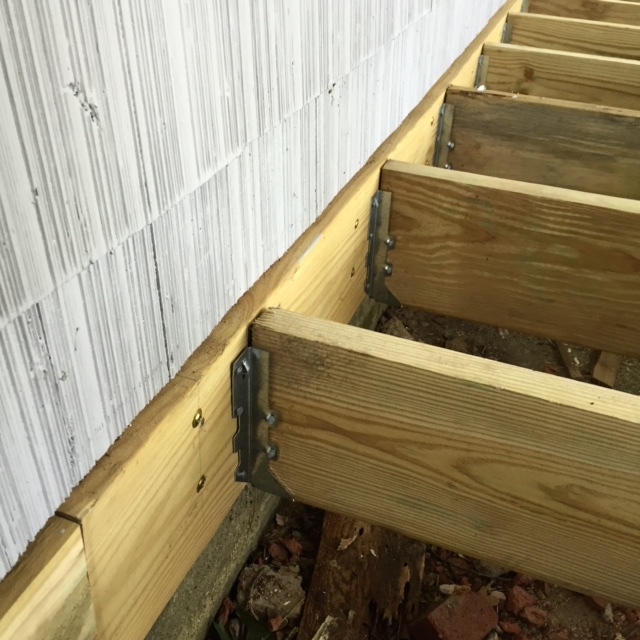 For those not in the know (like myself), joist hangers create another level of security/support for the beams of the deck. Let's do a little math, shall we (admittedly I am horrible at math)? There were 28 planks of wood, each needed a hanger on both ends. 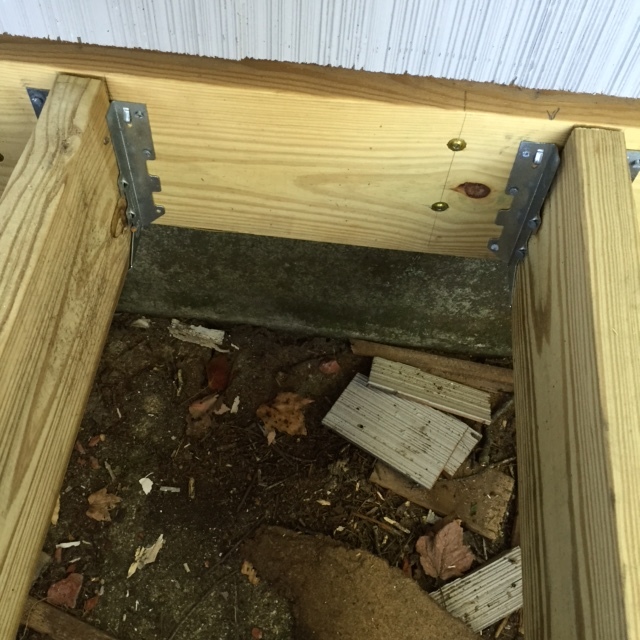 Each hanger needed 10 nails and each nail took about ten hits to be fully in. (Truthfully, I got much better at the end but I think I was averaging twenty+ hits per nail in the beginning. I was also swearing under my breath quite a bit.) What does that add up to? Me losing complete feeling in my thumb and middle finger and having lower back pain from being bent over all day. But after completing the final joist hanger I threw my arms up in triumph and yelled "I did it! ", followed by the Honey Pot dance (reference: the shimmy Pooh does whenever he's about to eat honey). Sadly, my father did not high five me. 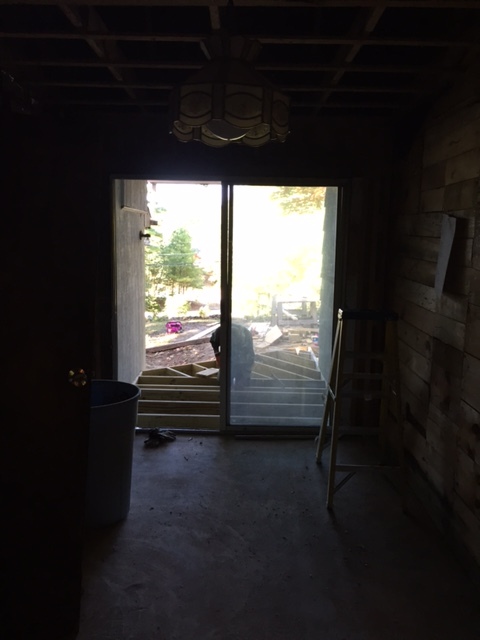 Behind the sliding glass door is what will be the kitchen. 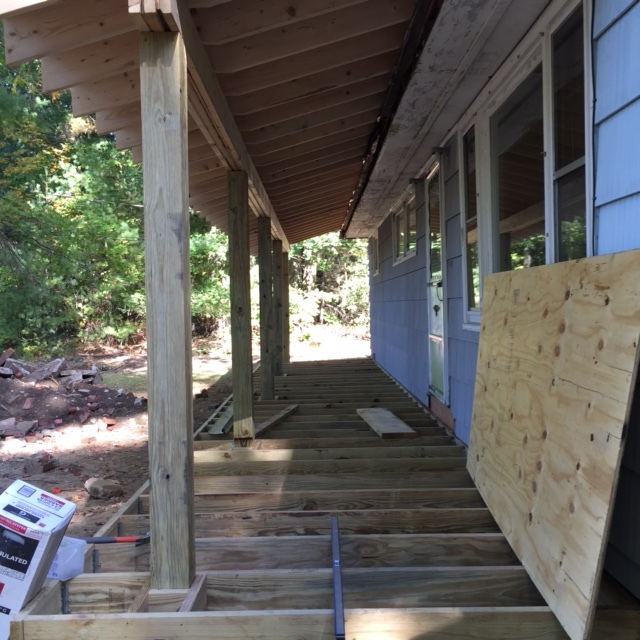 Before, it just had rickety wooden stairs but will soon have an extension of the farmer's porch. I don't know what the room was used for as it didn't have insulation or real walls. After completing the joist hangers, we drove to Harvey to pick up the custom windows we'd ordered the first week. I hate to harp on this but it's just so disgusting: the current windows are sticky. Why is that? From the chain smoking previous owner. So, so gross. I have a feeling that once they are removed and the new ones are installed it's going to smell a lot better in there. Also, they were so heavy carrying them into the house (remember that there aren't boards down on the porch so it's precarious walking regularly... then add something heavy and unbalanced in your arms) that I feel like my cats donned cat-size boxing gloves and pummeled me in my sleep. I was so physically exhausted last night that I was in bed before nine! But the thing is, on the days when I have to go back to my day-job in Boston, I miss being at the house. I feel like I'm missing out on something, not getting to see a step in the process. I wish I could be there full-time, but alas, I cannot. My father still believes we can finish by the end of the month. Maybe it's possible but it feels like there's still a lot of work to be done and I'm running out of vacation days to use. Help! Anywho, it's all coming along, slowly but surely. And I'm loving every minute of it. Well... maybe not the minute I punched myself in the face while holding the hammer. I could have done without that. I love reading these updates! 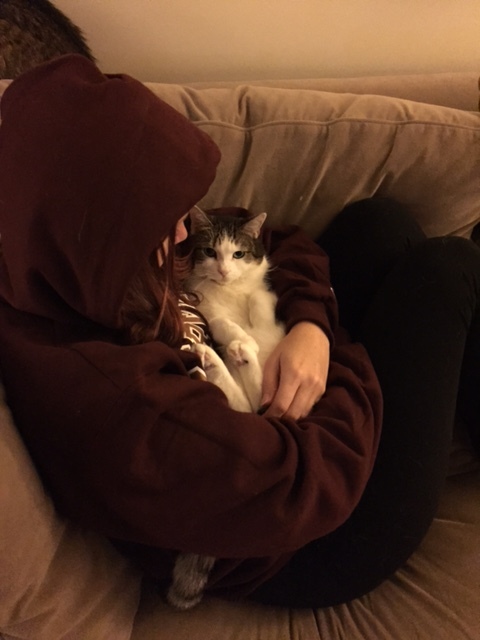 You are a total badass (even during the grumpy moments). Have fun in week 5!